After nearly a decade of layoffs, mergers/acquisitions, constant corporate change and cutbacks, threats of unemployment and volatile 401(k) values putting retirements at risk; is it any wonder that some of your co-workers are experiencing burnout? The medical profession is ripe for career burnout and the incidence is well-documented in the Journal of the American Medical Association, the Archive of Internal Medicine and other professional journals. What about the employees of companies outside the medical field? Are you using food, drugs or alcohol to feel better or to simply feel? Have you become irritable or impatient with with co-workers, customers or clients? Do you lack the the the energy to be consistently productive? 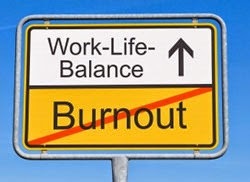 There are many factors that contribute to job burnout. It is a root cause of declining employee engagement, declining productivity and increased health care costs human resources is trying to reverse in the workplace. Corporate America didn’t need the 2010 Gallup study by Harter to tell them lower job satisfaction foreshadowed decreasing bottom-line performance. Back then Gallup estimate $300 Billion annually lost to employee disengagement. In the past three years, one of the most consistently viewed blog post I have written is about losing self-confidence as one ages in the workforce. Experienced workers face a host of challenges and this includes pressures at home to compound doing more with less at work. So this week, practice patience, tolerance and being human to your colleagues. Help is available confidentially through Employee Assistance Plans, health care professionals and through your trusted support network. Take some time to enjoy yourself over the next 168 hours! Positivity by Barbara L. Frederickson, Ph.D.